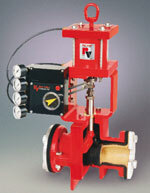 Red Valve’s Series 5200 control pinch valve is designed to provide accurate, repeatable control of abrasive and corrosive slurries. The elastomer sleeve produces a smooth venturi flow path that outlasts gate, plug, ball and stellite-coated control valves. The reinforced elastomer sleeve is the only wetted part of the valve, which eliminates the need for packing, valve seats and mechanical parts. The cone sleeve trim throttles applications for tighter control and range.